Born in Burnley and raised in Blackpool, former newspaper journalist Stephen Booth has not strayed far from his northern roots in a crime thriller series that has turned him into an award-winning author. Now living in Nottingham, Booth has made the dark brooding hills of the Peak District the atmospheric backdrop to his edgy and compelling Cooper and Fry crime mysteries which began with Black Dog and have now reached number fifteen in the series. These brilliant books, noted for their outstanding characterisation, authentic police procedural and magnificent evocation of landscape, have done so much to put the Peak District on the map that the National Park Authority has featured locations from the series in its Peak Experience visitors’ guides. As fresh, clever and convincing as the much-acclaimed debut in 2000, The Murder Road sees the newly promoted Detective Inspector Ben Cooper tackling a baffling case in the peaty foothills of towering landmark Kinder Scout. For the tiny Dark Peak hamlet of Shawhead, there is only one road in and one road out and the handful of people who live in this remote outcrop are accustomed to being cut off from the world by snow or floods. But when a lorry delivering animal feed is found jammed under a narrow bridge in the lane, with no sign of the driver Malcolm Kelsey except for a blood-stained cab, it’s just the beginning of something much more sinister. Who would want to kill Kelsey? The answer may lie in a terrible death crash which took place not far from the bridge eight years ago. DI Ben Cooper from Derbyshire Constabulary’s E Division is called in to investigate what is looking like a suspected murder but the residents of Shawhead are suspicious of strangers and reluctant to help the police. Cooper, who is feeling increasingly uncomfortable at the arrival of new team member sergeant Dev Sharma from Derby, must attempt to unravel the history of secrets, lies and loyalties that will lead him to the truth behind the missing lorry driver. 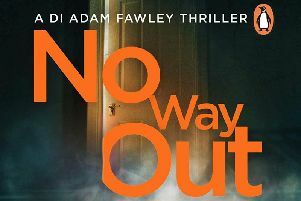 And when the case takes a dramatic turn, will he look for assistance from Detective Sergeant Diane Fry, his old flame now working in Special Operations at Nottingham’s Major Crimes Unit, or his new right-hand man? The Murder Road sees born storyteller Booth at the top of his game. His gripping mysteries are classy, classic whodunits, all perfectly plotted and packed with clues, conundrums, deft detective work and stunning twists. But it is just as much his paean to the dark beauty of the rugged Peaks that make these books so seductive to readers both familiar and unfamiliar with this corner of the country. Whether he is trawling the streets of former cotton town New Mills in the shadow of the spectacular Torrs gorge or taking us to the heart of the picturesque countryside around Buxton, Booth’s passion for the Peak District is his driving force.